The Boston Terrier is the first breed that originated in the United States to be recognized by the American Kennel Club. They were originally created by breeding a mix of bull and terrier type breeds with the result weighing upwards of 40 pounds. It is believed that the original cross was an English Bulldog and the now extinct English White Terrier. After the original pairing, the Boston Terrier was bred down utilizing smaller females as well as French Bulldogs, thus creating the original foundation of the breed. The Boston Terrier went by the name American Bull Terrier for a short time, but this was not well received by the Bull Terrier community and so the breed was renamed after its place of birth. The Boston Terrier is also referred to as the Boston Bull, the Boston Bull Terrier and the American Gentlemen. The Boston Terrier will reach heights of 15-17 inches. By the American Kennel Club breed standard, the Boston Terrier should not weigh in at less than 10 pounds or more than 25 pounds. The Boston Terrier's coat is very short and fine with moderate shedding. The most common coat colors for the Boston Terrier are black, brindle, seal or a combination of the three over a white background. Other colors such as liver, cream, red and brown are possible, but far more rare. These additional colors, while eligible for American Kennel Club registration, are not able to be shown in the ring. The white on the body of the Boston Terrier should cover the chest, muzzle and neck. White should also be present up to half way up the forelegs and up to the hocks on the rear legs. There should be a white blaze that reaches from the muzzle towards the top of the head, but should not touch the eyes. The Boston Terrier is a very playful, affectionate and loving breed that was bred down from the fighting ring to become an excellent family pet. The Boston Terrier will learn quickly, as they are quite intelligent. However, it is imperative that a firm and consistent pack leader take charge from a young age. The Boston Terrier can become quite stubborn and willful if left to believe that they wear the pants in the pack. The Boston Terrier is not typically utilized as a guard dog, however, it is not uncommon for a Boston Terrier to bark when necessary. The Boston Terrier is a very playful, affectionate and loving breed that was bred down from the fighting ring to become an excellent family pet. The Boston Terrier will learn quickly, as they are quite intelligent. However, it is imperative that a firm and consistent pack leader take charge from a young age. The Boston Terrier can become quite stubborn and willful if left to believe that they wear the pants in the pack. The Boston Terrier is not typically utilized as a guard dog, however, it is not uncommon for a Boston Terrier to bark when necessary. The Boston Terrier is an energetic, friendly and gentle breed that is known for his exceptional character. They are known to be very well mannered and enjoy the company of children of all ages. The Boston Terrier is also recommended as a companion for the elderly. The Boston Terrier does not have much of a prey drive and so they have the propensity to get along well with cats and other small animals. The Boston Terrier must be socialized well at a young age however, to avoid aggression towards other dogs. You can find Boston Terrier puppies priced from $200 USD to $3000 USD with one of our credible breeders. Browse through our breeder's listings and find your perfect puppy at the perfect price. The Boston Terrier is an energetic, friendly and gentle breed that is known for his exceptional character. They are known to be very well mannered and enjoy the company of children of all ages. The Boston Terrier is also recommended as a companion for the elderly. The Boston Terrier does not have much of a prey drive and so they have the propensity to get along well with cats and other small animals. The Boston Terrier must be socialized well at a young age however, to avoid aggression towards other dogs. The Boston Terrier will adapt well to apartment living and requires only a small area to play outdoors, as they are relatively inactive inside. The Boston Terrier's smooth short hair requires minimal grooming. They require brushing with a firm bristle brush and baths only when necessary. Their eyes and faces will need to be wiped clean on a daily basis. The Boston Terrier's eyes and ears should be checked regularly for foreign objects as well as ticks. The Boston Terrier is very intelligent and will learn quickly from a consistent pack leader. It is very possible for this willful breed to develop Small Dog Syndrome, so it is necessary to exert yourself as the pack leader from a young age. The Boston Terrier will respond best to a firm, yet affectionate approach to training. 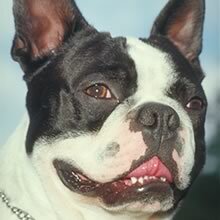 The Boston Terrier requires a good long daily walk and/or a good romp in a fenced yard to keep them happy and in shape. Boston Terrier Puppies for Sale - Shipped Worldwide! Finding the right Boston Terrier puppy can be dog gone hard work. PuppyFind® provides a convenient and efficient means of selecting and purchasing the perfect Boston Terrier puppy (or Boston Terrier puppies) from the comfort of your home, 24 hours a day, 7 days a week. Take advantage of our PuppySearch or leisurely browse our directory of hundreds of dog breeds, Boston Terrier dog breeders, Boston Terrier dogs for adoption, and Boston Terrier puppy for sale listings with photos and detailed descriptions. Some Boston Terrier puppies for sale may be shipped Worldwide and include crate and veterinarian checkup. Many Boston Terrier dog breeders with puppies for sale also offer a health guarantee. With thousands of Boston Terrier puppies for sale and hundreds of Boston Terrier dog breeders, you're sure to find the perfect Boston Terrier puppy.